Okay, we’ll admit it. This is an audacious list. Indeed, it would be fair of you to ask, how can we possibly rate and rank the islands of the world according to their golf appeal? How can we possibly compare Amelia to Australia, Hainan to Hilton Head, Pawleys to Puerto Rico? 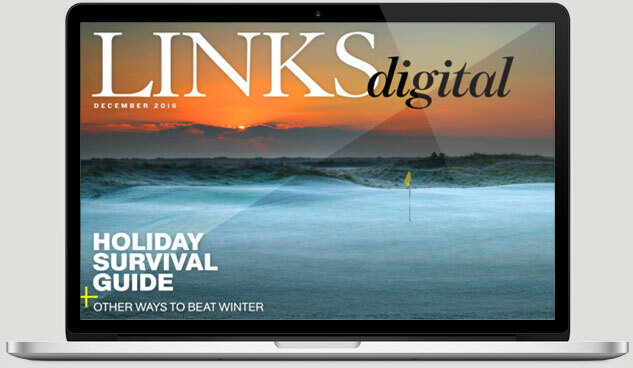 Well, if you’re LINKS Magazine, you find a way. If you’re LINKS, the publication that, for more than a quarter century, has been the game’s number-one arbiter on where to go, play, and stay, the real question is how can we not produce such a list. After all, when it comes to desirable vacation destinations—whether for golf or anything else—islands are the first places that jump to mind. 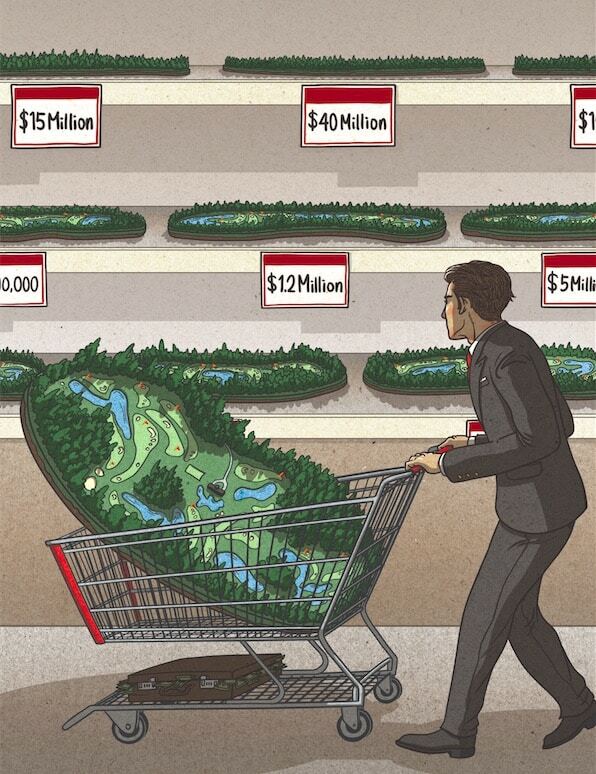 Moreover, in any ranking of the world’s top 100 courses, more than half are situated in towns, counties, provinces, nations, and continents surrounded by water. For LINKS, this list was a natural. Of course, that didn’t make its creation any easier. Fortunately, we had a couple of things going for us. 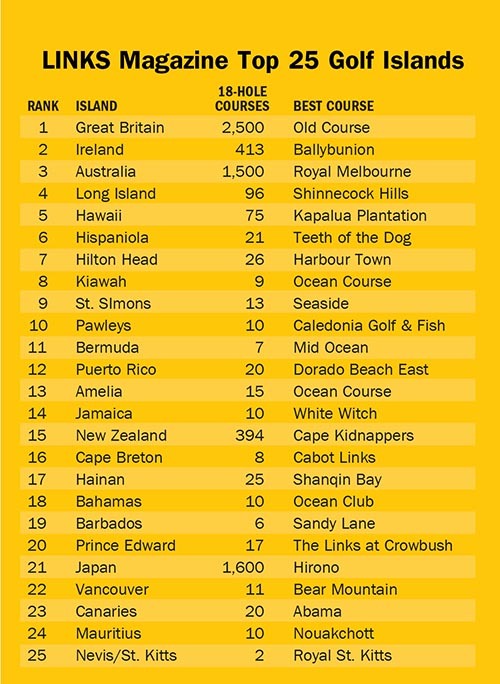 Number one, inasmuch as no one had ever attempted to rank the best golf islands of the world, we could take some comfort in knowing that our list—no matter how it came out—would instantly be the best. Number two, since this was uncharted territory, we were not bound by any hard and fast criteria, no established method or metrics to force our thinking. That said, there were plenty of statistics to consult, beginning with the sheer number of golf courses on each island. Mass matters, of course. On the other hand, mass without class is of little value; that’s why Japan, despite its whopping 1,600 courses, ranks only 21st on our list. By the same token, class alone is not enough. An island may be home to a world-famous course, but if that’s the only game in town, well, it explains why Fishers Island didn’t make the cut. Just as important, however, are the intangibles. 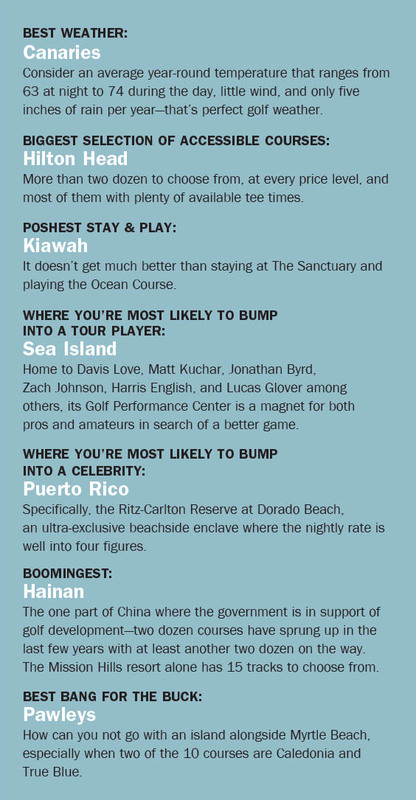 Among the criteria applied by our ad hoc panel of island-golf aficionados, ease of access ranked very high. How accessible is the island, and once on it, how easy is the navigation among the best courses? 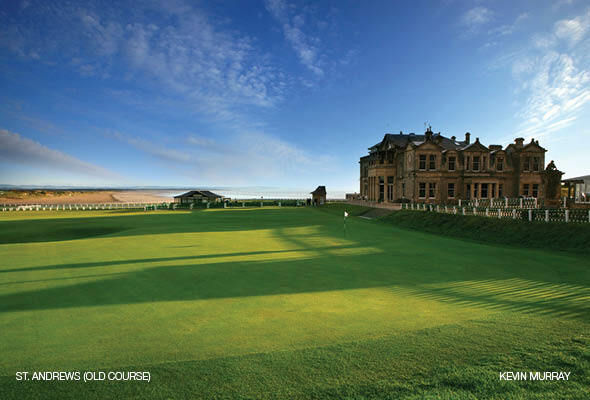 As to the courses themselves, how open and welcoming are they to traveling golfers? Finally, there is the question of affordability. If you’re paying a small fortune to get yourself to a remote atoll, you don’t want to pay a second fortune in green fees. As we began to apply our criteria, certain islands quickly sorted themselves to the top (or bottom). In the end, however, the numerical rankings came down to a series of matches. For example, we asked ourselves, if confined to golf on just one island, which would it be, Long Island or Hawaii? If the answer was Long Island, we asked whether that would still be the answer if the alternative were Ireland or Australia, or any of the two dozen others. Eventually, one island won all its “matches” and thus became our number one, a second island won every match except the one against island number one, so that became number two, and so on until we had our list of 25. 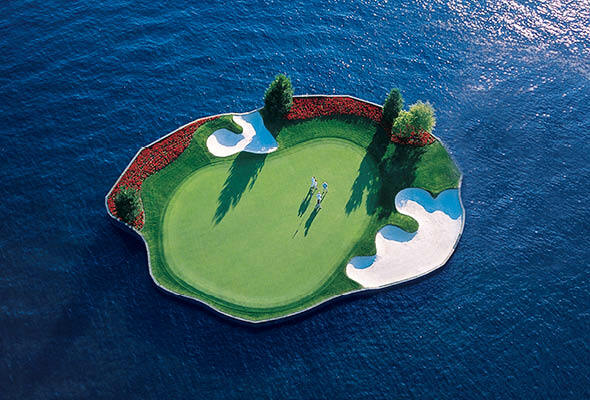 Here then, for your inspection, the world’s first list of the Top 25 Islands in Golf. Is it definitive? Certainly not—no such list can be. Is it defensible? You bet. And the winner is… Great Britain. 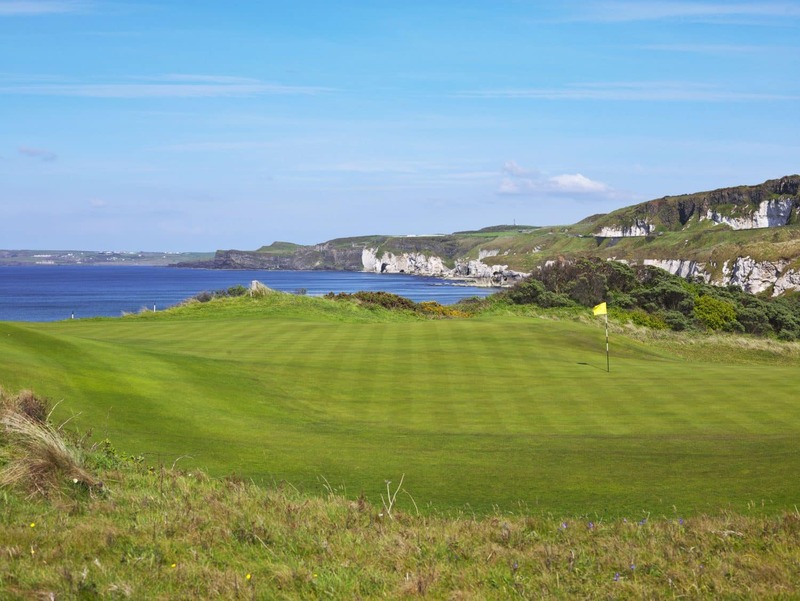 With more golf courses than any island on the planet—in fact, almost 1,000 more including over 30 of the world’s top 100—the sceptered isle is clearly in a class by itself. It may also be the most fun place to visit, whether on a buddy trip or with your significant other, the charm of its cities and citizens almost equal to the challenge of its courses. The only major contender in that regard would be world island No. 2, Ireland (which in this case includes both the Republic of Ireland and Northern Ireland). Navigating the narrow winding roads can at times be a challenge, but the journey usually ends at a course with jaw-dropping views. In third place is the world’s largest land mass—Australia—with its glittering collection of courses in the Melbourne Sandbelt and Mornington Peninsula, not to mention the two Tasmanian stunners, Barnbougle Dunes and Lost Farm. In all, nine courses from Down Under appear on various top 100 lists. Then it’s back to the western hemisphere for the first island that is neither a nation nor a continent—our very own Long Island. Granted, it’s not the first place you think of as a relaxing vacation destination (the notorious New York area traffic can be less than soothing to the soul) but no island on earth boasts a higher concentration of first-rank courses—Shinnecock, National, Maidstone, Garden City, Friar’s Head, Sebonack, Piping Rock—the list could go on for another dozen including sites of both the U.S. Open and PGA Championship, among them Bethpage (Black), one of several good courses that are open to all and as affordable as metropolitan area golf gets. If, however, you crave something a bit more laid back, the quintessential island golf destination awaits in the fifth spot—Hawaii. Indeed, of the five main islands that comprise the Aloha State, three of them—the Big Island, Maui, and Kauai—likely could have made our list on their own, so strong and deep is the array of courses, most of them open to the public. 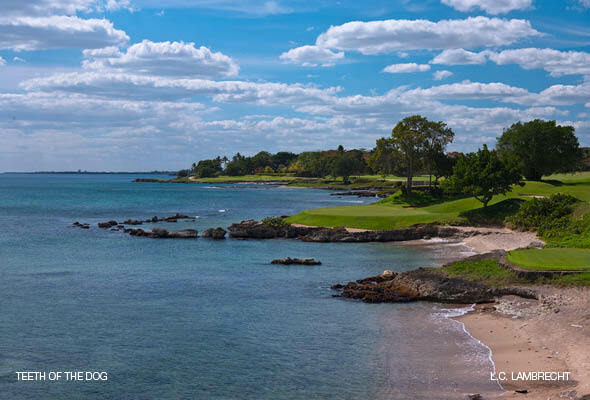 Hispaniola may not ring a bell as a golf mecca, unless you know it’s the island that includes the Dominican Republic, home to the resorts at Casa de Campo and Punta Cana, whose courses make this hands down the number one golf destination in the Caribbean. Okay, enough exotica. 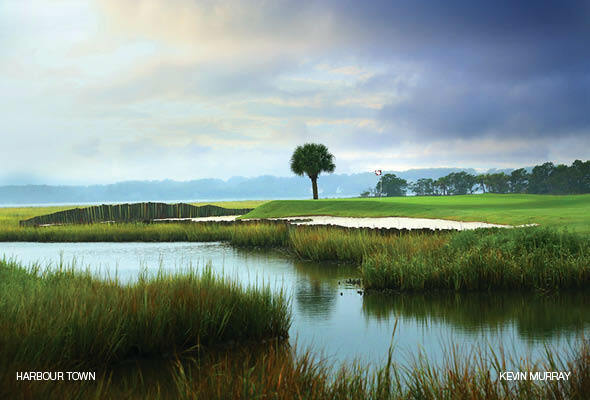 The four islands that complete our top 10 all lie along the southeastern coast of the U.S. Hilton Head, with its plethora of courses led by venerable Harbour Town, is followed closely by Kiawah, the only island that has held both a PGA Championship and a Ryder Cup. St. Simons Island comes next, thanks in large part to the three strong courses at the Sea Island Resort, while Pawleys, a tiny (one square mile) island at the southern tip of Myrtle Beach, wins our nod for both ease of navigation and value. The remaining 15 islands bring us back to the U.S. only once, at Florida’s Amelia (No. 13), along with a visit just offshore to Bermuda (11) and five more ports of call in the Caribbean—Puerto Rico (12), Jamaica (14), Bahamas (18), Barbados (19), and Nevis/St. Kitts (25). Perhaps surprisingly, Canada checks in with three winners in up and coming Cape Breton (16), Prince Edward (20), and Vancouver (22). The others are literally oceans away: led by diverse New Zealand (15), China’s burgeoning Hainan (17), 1,600-course Japan (21), Spain’s Canaries (23), and Africa’s Mauritius (24).